Spelter is a type of metalware in the form of zinc that’s been treated to look like bronze. It’s commonly used in reference to ingots. The item pictured here is a fine and rare patinated spelter centerpiece being offered in Dirk Soulis Auctions’ February 25th auction, online and in the firm’s gallery at 529 West Lone Jack-Lee’s Summit Road in Lone Jack, Missouri, starting at 10 am Central time. The sale will feature the contents of The Vintage House Restaurant in Warrensburg, Missouri, where the late owner displayed his wonderful Victorian collection. 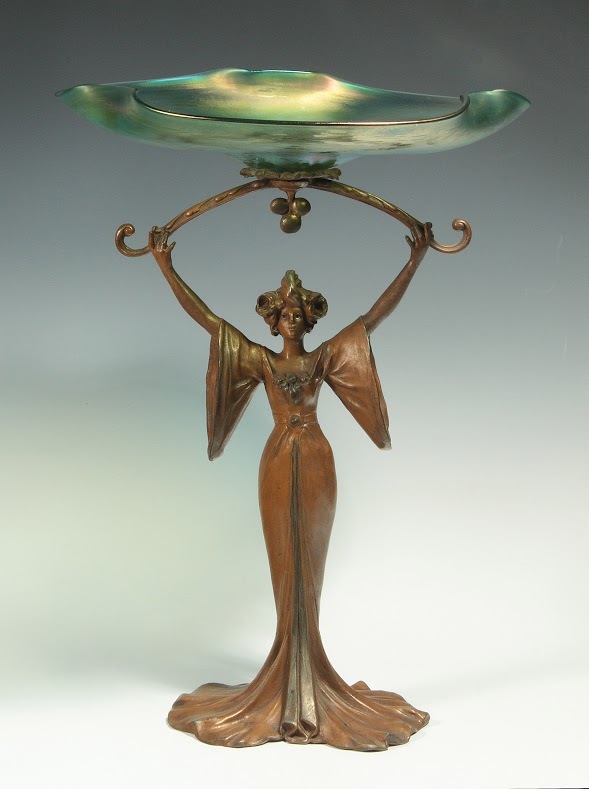 Back to the spelter centerpiece: The standing female figure in a flowing gown holds above her a green oil spot art glass dish with folded rim and drilled opening at the pontil area (blown from the bottom as many pieces attributed to Loetz would have been). The signature of “Aug Moreau” is cast within the folds of the gown gathered at the base of the 17-inch-tall spelter figure. The origin of the word spelter is unknown. It’s thought to be either German or Dutch.